It’s likely A-10 teams are going to find themselves dreading facing the Saint Louis Billikens this season. Travis Ford has built a tough, physical team that will grind out wins and make opposing teams fight tooth and nail for each and every basket and fight as hard as they can for every rebound. SLU stands as a old-school style team even as basketball teams across the country and at every level trip over themselves to build the next Warriors. 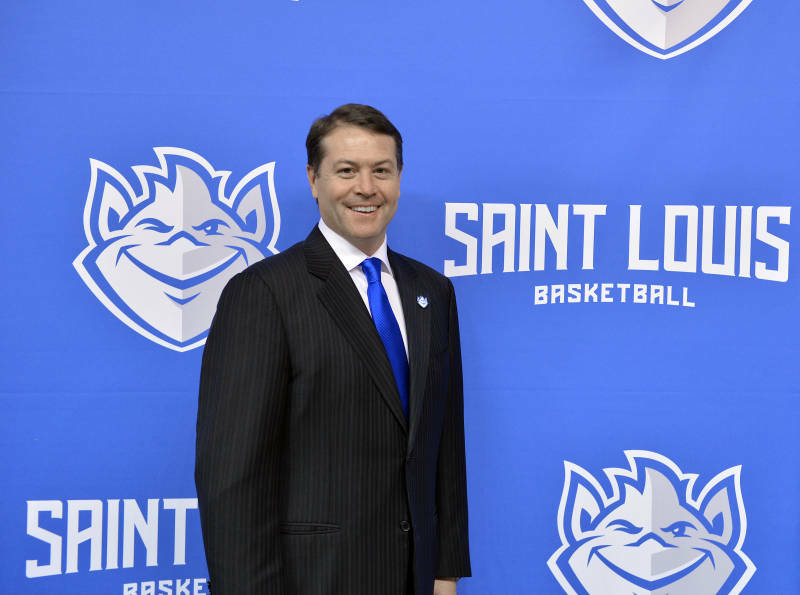 The Billikens are stuffed to the gills with strong, tough and athletic players at every position. It starts with point guard Jordan Goodwin. Goodwin is probably the only starting point guard in NCAA Division I currently who was also recruited to play tight end for a power conference. There’s tough, and there’s “our point guard could have been an Iowa tight end” tough. Goodwin plays with a physicality not many guards can handle, and at 6’3′ with long arms, Goodwin can guard 1-3, and probably even some 4s if necessary. Last year, Goodwin led the team in rebounding with 7.5 rebounds. Goodwin is also a real threat to lead the nation in steals, after averaging 2 per game last season. His likely backcourt mate, Tramaine Isabell, stands only 6’1, but also averaged 7.5 rebounds last year playing for Drexel. For some teams, not having enough points or touches to go around is a problem, but for SLU, the problem may be not having enough rebounds to go around. Senior wing Javon Bess was one of the best players in the A-10 last year, and looks to improve this year. Bess is 6’6′, 220 and is able to guard the 1-4 spots. He’s tough, quick and athletic and has the potential to be a lockdown defender, especially as he will be expected to carry less of the scoring load than he did last season. Bess also is an effective rebounder, and got a decent amount of points last season—especially for a wing—from pulling down offensive rebounds. That brings us to SLU’s frontcourt, which might be the best in the A-10. Ford has a four-headed monster in sophmore Hasahn French, freshman Carte’are Gordon, junior Luis Santos and senior DJ Foreman. French made huge strides throughout his freshman season and by the end of the year, was probably the best freshman big man in the A-10. Though only 6’7″, French is insanely bouncy and strong, coming up with huge dunks and coming down with thunderous dunks all last year. He’s only going to be more skilled, stronger and quicker this year, and will be a nightmare for A-10 defenses this year. With apologies to Rhode Island’s Jermaine Harris, Gordon is going to be the best freshman big man in the A-10. He has uncommon quickness and ball handling skills for a big his size, and possesses high level athleticism. Gordon will be a handful on both sides of the ball and a complete menace on the boards. He and French will likely start in the frontcourt and though they will be one of the youngest frontcourts in the A-10, they will probably be the best. Opposing teams won’t get much slack when Santos and Foreman are in either. Santos is a tank at 6’8″, 250 pounds, and is probably the strongest member of the team. He also has the best array of low post moves on the team, which will make him very hard to stop on offense. Foreman started slow last year, but by the time A-10 play rolled around, he developed into a key member for the Billikens. Foreman was most effective driving to the hoop from the top of the key, and at the top of Ford’s 1-3-1 zone, which allowed him to use his quickness and length to take advantage on both ends of the court. These Billikens aren’t without problems: integrating 8 new members into a team is never easy and there is a definite lack of shooting on this team. However, Ford is a charismatic leader and should be up for the task of integrating all of the newcomers. As for the shooting problems, there are times when the games might get ugly, but the Billikens’ should be able to stay in games with their defense, toughness and inside scoring. One thing is for sure, playing Saint Louis will not be a cake walk for any opponent next year.